If you're pregnant and so incredibly excited to meet your baby that you're just not sure you can wait nine months, I may have just the thing for you. My friend who lives in Australia recently sent me an article about a company called 3D Baby that has started selling 3D versions of your ultrasound images. That's right folks, for a mere $700 you can own a life-size version of your fetus! Based on my own experiences, all babies pretty much look the same in ultrasound images (i.e. like aliens), but I guess this could be the perfect gift for the couple who really does have everything. When you order your creepy 3D fetus, you can choose a light, medium or dark skin tone and whether you want to have the arms and feet waving in the air or curled up in a classic fetal position. Oh, and don't forget to decide whether or not you want baby's private parts on display or discreetly hidden. Whichever way you decide to go on the genital front (pun intended), your baby sculpture will arrive safely nestled in a satin-lined box that looks disturbingly like a coffin. Already given birth to your baby? Not to worry! If you hung on to your ultrasound images you can still order a 3D fetus! Thanks, but I think I'll pass. I'm pretty sure I can come up with enough conversation topics to negate needing a plaster fetus sculpture hanging out on my coffee table. That is.. um... disturbing. I mean, I posted a labeled ultrasound photo on my office door when I was pregnant, but I was a scientist working at a natural history museum full of folks into that sort of thing. 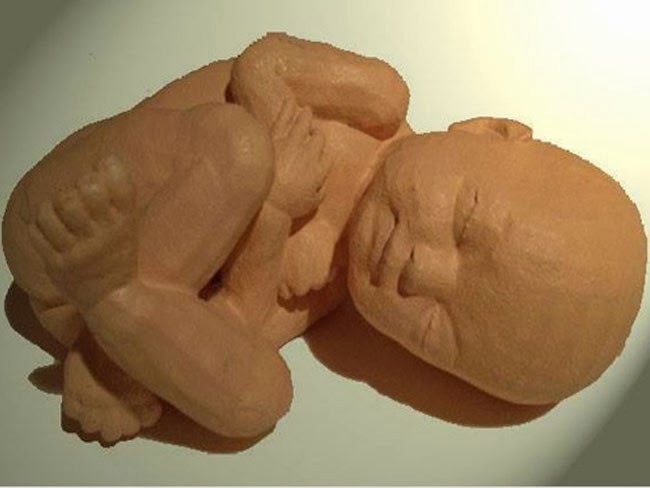 I can't imagine showing my now 9-year-old son a 3D model of what he looked like as a fetus. The ultrasound images are strange enough!